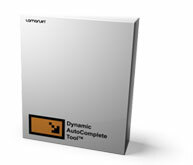 Dynamic AutoComplete Tool is a .NET component that extends WinForms TextBox and ComboBox controls with autocompletion capabilities. Although the .NET Framework provides rich foundation for WinForms application developers, it doesn't provide any built-in autocompletion support! Dynamic AutoComplete Tool fills the gap by bringing autocompletion capabilities to WinForms applications. Users of your WinForms applications can enjoy the same autocomplete functionality they already know from within Internet Explorer, Microsoft Office and the Windows Shell. At $49.95 (USD, single user), you'll get all of the benefits above, plus full Visual Basic .NET source code, free updates and significant discounts for other products from the Dynamic .NET Tools™ family (coming soon). Please note: Dynamic AutoComplete Tool requires .NET Framework 1.1 and Visual Studio .NET 2003.